Finally. My vacation is finally here. We haven't been anywhere since this time last year for our anniversary. People who say they need a vacation for what feels like every dang month have no idea. They want a vacation, they don't necessarily need it. Not yet, anyway. I've definitely learned the difference. Maybe that's just me. I mean, I always want to go somewhere but it's not often a question of need. Having been through a stressful year, I feel like we can really appreciate this time away. And I am so so so happy to have a reason to pack my suitcase again! And in my overpacked suitcase (because that's how I roll), I have my makeup bag. It's the one area where I try to bring the bare minimal. Go figure. Here's what I am taking with me! The bag is by Cath Kidston. Love her prints! Juicy Bamboo Cleansing Cloths - Taking a few of these to help remove my makeup. Revlon ColorStay concealer - This and the MUFE one are my faves right now. MUFE Aqua Eyes in 24L - This bad boy goes with me everywhere. Always a repurchase. MAC Painterly Paint Pot - One of my favorite bases that I always seem to find my way back to. Benefit They're Real mascara - Love using up samples on trips! MAC MSFN in Light Plus - Not my favorite powder anymore, but I do still like it. Essie polish in Turquoise and Caicos - I like to take the polish I'm wearing to cover any chips. Rimmel London Kate #17 lipstick - She's a beauty, this one. Perfect peachy pink! Benefit Total Moisture face cream - I like this during colder months. Time to use up another sample! NARS Bellissima eyeshadow duo - Perfect neutral pair to get me through a short trip. Urban Decay All Nighter spray - The best spray for keeping my makeup looking fresh. Benefit Coralista blush sample - Benefit rocks at samples, FYI. This gives a nice glowy finish. Dior Creme Abricot nail cream - Cuticles and cold weather do not get along. At all. The Body Shop White Musk perfume - It's a spray and a perfect size. Smells light and fresh. Nivea lip balm - Always a mainstay. MUFE Full Cover concealer - HG! Covers anything and everything. I never leave home without it. ELF Eyebrow Kit in Light - Gets the job done well and at a fraction of the price of other kits. Enjoy your vacation! 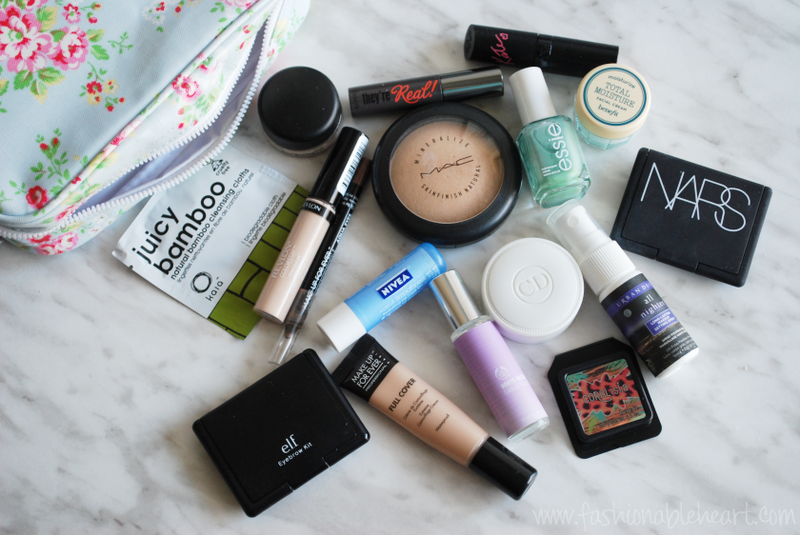 It's easier said that done sometimes, but keeping the makeup bag minimal when you go away is probably a good idea. Less to lug around, less chance of leaving stuff behind in the hotel! I hope you've had a really great weekend away!! Even just a quick trip is always such a nice escape from the everyday and a way to just relax! Hope you enjoyed your trip! I've been dying to try the benefit box blushes! I may have to go get one soon! Thank you! Definitely one of my favorite products that Benefit makes. A lot can be hit or miss, but the blushes are great and smell good too! Seriously, one of my worst fears when traveling. I'm the person running around checking everything ten times to make sure I didn't forget anything! Now if I could just teach myself to pack lightly in other categories. Oh well, at least I'm covered for changing my mind with outfits and everything else that pops up unexpectedly. LOL! It was my first time and I think I'm in love. What a little paradise! Hope you had fun on your trip, as well!